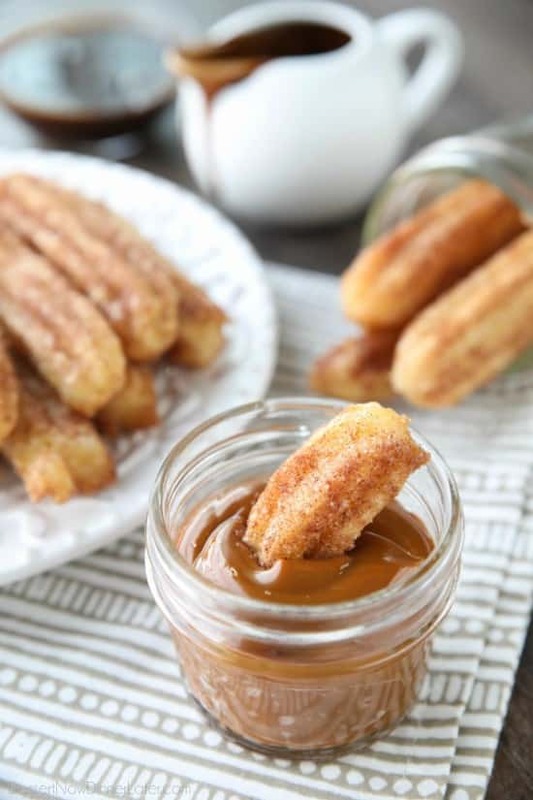 Churros Recipe - Dessert Now, Dinner Later! 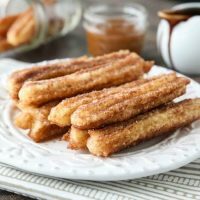 This churros recipe is super easy to make with a simple churro dough that is piped into oil and fried, then coated in cinnamon-sugar. 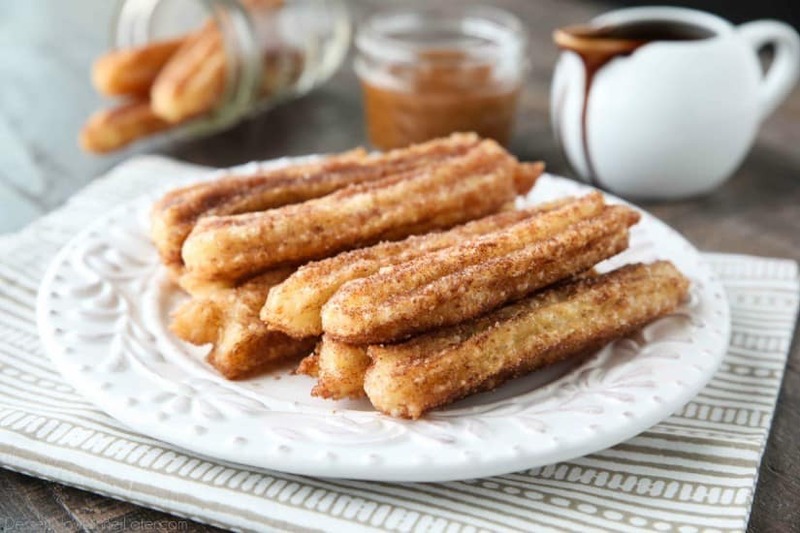 You can enjoy these crisp, yet soft homemade churros anytime! Ever since we went to Disneyland (in February) I’ve been craving churros like nobody’s business. We had traditional cinnamon-sugar churros and rose-gold churros that tasted like strawberries. So good! Today, I’m sticking with traditional churros, because you can’t beat a classic! 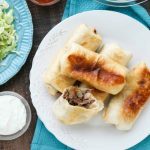 What’s in this Churros Recipe? 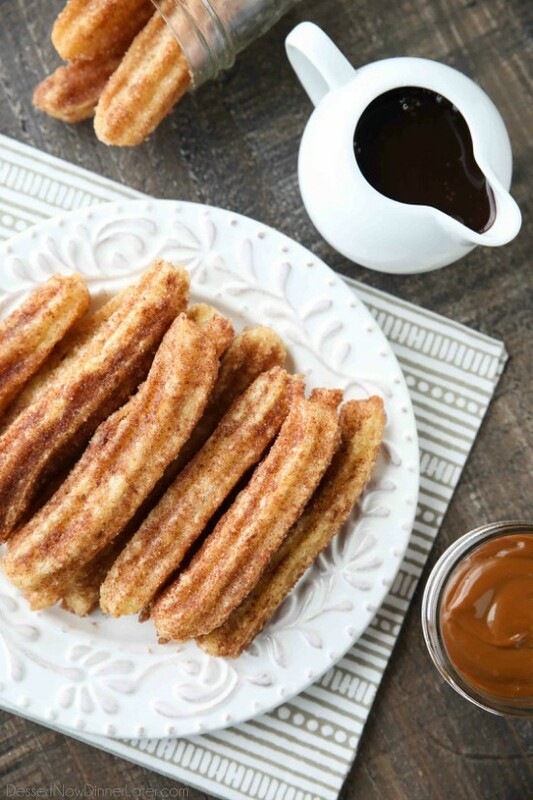 This churros recipe isn’t stuffed, but you bet that I put some dulce de leche and chocolate sauce on the side to dip them in! Yum! If I had known just how easy homemade churros were to make, I would have made them much sooner! I guess all it took was a craving to make some of my own. Enjoy my friends! Place water, butter, sugar, and salt into a medium saucepan. Bring to a boil. Add flour and mix vigorously until dough balls up, and everything is well blended. Remove from heat. Place dough into the bowl of a stand mixer fitted with a paddle attachment. Mix on low until steam disappears. Add egg while the machine is on, turn speed up to medium, and mix until incorporated. 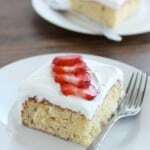 Scoop dough into a piping bag fitted with a star piping tip. (I used a Wilton 2D tip. Make sure the tip is slightly rounded -- helps prevent churros from splitting.) Combine cinnamon and sugar on a large plate and set aside. Heat oil in a large frying pan or stock pot. To test the oil for frying, drop a tiny piece of dough into the oil. Once it browns, you are ready to pipe the churros in. Remove churros and place on a paper towel to absorb excess oil. While still warm, roll churros in cinnamon-sugar mixture. 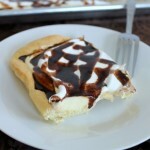 Serve with dulce de leche or chocolate sauce, if desired. * Can mix completely by hand. 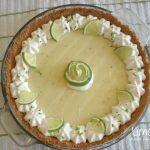 Allow dough to cool slightly before adding the egg, so it doesn't scramble. Stir vigorously once adding the egg, until it binds together. Churros con chocolate always hit the spot! Do you have a favorite chocolate sauce recipe, or do you use store-bought?